The last time Little Man came to visit, he came with some new features. He’s a year and a half old now, and during that weekend he reorganized my spice rack (I did the labels, which seemed smart since half of the jars were out of the pantry anyway), worked out with my hand weights, and ran around the house in Grandpa’s big shoes. Also, he’s taken up dancing. We were trying to figure out what step he’s doing—it looks like a cross between the merengue and the salsa, with a little hand clapping thrown in. Whatever it is, he has a really good time. 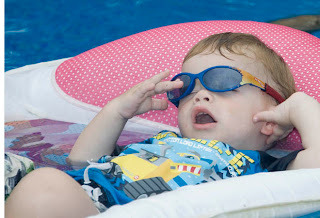 He was so tired by the time we took him to the pool, I think he was practically napping on the float. Another feature of Little Man 1.5 is that he’s learned to give treats to the pets—in a manner of speaking. We taught him to toss koi food into the pond. Once, when some of the food fell short, he tried to pick up every piece that he’d dropped. He’s a detail person. Next, I showed him how I toss a few kitty treats onto the floor at the cats’ dinner time. (Frasier loves that—he thinks he’s actually hunting.) Little Man began following the cats around, tossing various snack items at them. He loves to share—he always has, even when it involved food that he absolutely adored. On Monday, the day after they left, I found a Cheese Nip in the cats’ bed. To see an example of Little Man’s happy feet, click on the 'play' button below! Love the video! He has some killer moves! This was absolutely adorable! I loved the music. He was the perfect little dancer with "happy feet". Roomie--catchy tune, isn't it? Mommadrool--and he loves the water park! Lady RidesaLot--glad you enjoyed it!